Today we headed off to Notre Dame cathederal. The metro is fabulous, the stations may be ugly and the rolling stock old and tired but there seems to be a station right next to every tourist icon in Paris and at 1.70€ per trip you cannot complain about the price. As soon as we emerged from the metro we were rewarded with a sight of the Notre Dame cathederal. The were a lot of tourists around despite the cold and overcast weather. Most of Paris’ icons have security staff and bad screening before you can go in. No so with the churches. 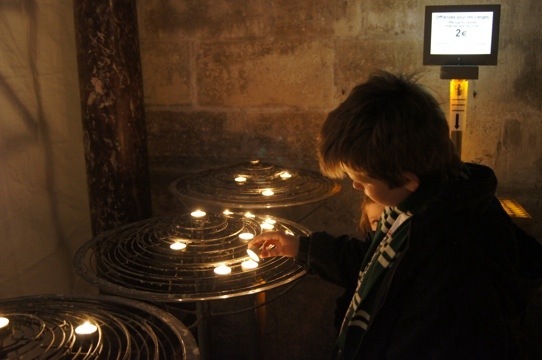 We could freely walk into both Notre Dame and Sacre Cour without being screened. This is interesting because if I were a terrorist I would be quite satisfied blowing up an 850 year old religious icon that belonged to the infidels. You are not allowed to use flash photography inside the cathedral and it is quite dark so photo opportunities are limited. Inside the cathedral is quite beautiful and it is amazing to think that it was constructed 850 years ago without the aid of electricity or hydraulics. Once we had wandered around for a while we waited outside for a chance to walk up to the top of the tower. The queue was about 30 metros and seemed to be moving quickly, but it was mighty cold and quite windy. After about 20 mins of waiting we were told, in broken english, that someone had taken I’ll in the tower and that they had to be treated and removed before we could go up. We waited another 40 mins in the queue. Fortunately there was cafes across the street from our queuing spot which kept us feed and invigorated, but after 40 minutes and the queue not moving at all we decided to leave hypothermia behind and headed for a cafe for pizza, coffee and a bowl of chips. Having thawed out we headed back on the metro and one stop later weere at the Musee d’Orsay. Wadering around the Musee d’Orsay you come to appreciate how much history and culture France has, especially in comparison with Australia. The museum building is interesting. In design it is a bit like a huge barn or a big station with a huge domed roof. I am sure the museum curator would hate this comparison but it fits. Mind you it is a very beautiful barn filled with some of the best known art works in history. I am no art buff but I could not help but be impressed by the collection of art works by names such as Manet, Monet, Van Gogh and Rodin. We saw a number of famous paintings including the self portrait of Van Gogh (with his ear still in tact). I would need to check but I would think that the Musee d’Orsay would have the best collection of impressionist art in the world. I think Sophie hated the Musee d’Orsay. It is hard to explain impressionist art to a 5 year old, especially when you do not understand it yourself. From the moment we walked in Sophie wanted to go home and I kept telling her that we were headed towards the exit as we circled around the various exhibits. 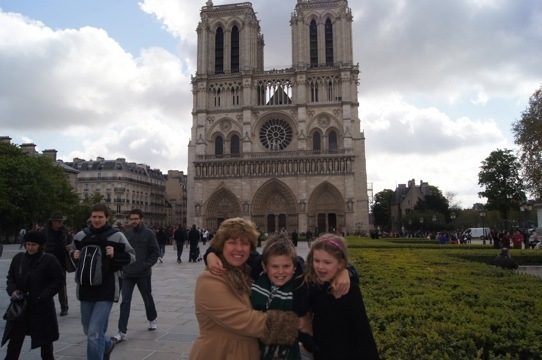 I do not blame her we had already wandered around Notre Dame cathedral and waited in the cold for an hour in an abortive attempt to walk up the dome of the cathedral.